In addition to my z-axis research in the Maker Lab this year, I am working on a small-scale project for a scholarly indie game, developed in conjunction with the Modernist Versions Project and Implementing New Knowledge Environments. Soon we’ll have more details to share, but—while we have been researching and prototyping the game—I’ve been working through the connections between scholarly editing and videogame design. Last spring, I conducted research on the editorial history of Marcel Proust’s unfinished nineteenth century novel, Jean Santeuil. Encoding the differences between the first two published editions of the novel, and using a tool called modVers to express the differences between those two editorial efforts, I suggested that the task of working through these editorial processes engages Proust’s modernist conceptions of temporal and individual development. As I described in my previous post on Jean Santeuil, versioning Proust’s unfinished novel did not simply allow me to read Proust’s modernist technique; it also allowed me to actively work through the genesis of that technique. This hands-on, procedural experience of encoding Proust forced me to unpack Proust’s fragmented construction of narrative chronology. The fragment I encoded describes Jean’s trip to Penmarch during a stormy day. In the original draft pages of the book, Proust wrote two contradictory versions of the trip that were left unrevised. In one version of the passage, Jean travels by car to Penmarch; in another version, he encounters two women and a biker on a train (the biker comes back in a later section of the book). The first published edition of the novel, edited by André Maurios and Bernard de Fallois, argues that Proust intended to join these scenes through the process of revision, excising a paragraph and reordering the two passages such that Jean’s car journey becomes continuous with his travel by train. The scholarly edition of the novel, edited by Pierre Clarac and André Ferré, maintains the separation between these two accounts, preserving a fractured, contradictory, and unfinished narrative. Encoding the difference between these two editorial interpretations of the passage works through Proust’s evolving construction of temporality. 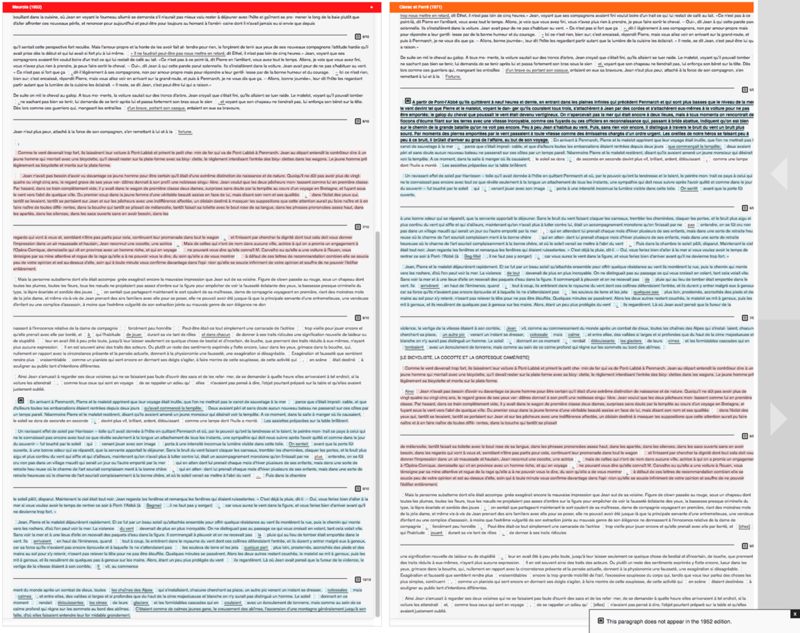 In order to structure the rearrangement of narrative events using TEI, I had to navigate between disparate sections of the document, copying and pasting variant chunks of text that appear in different sections of each version. As I navigated the spatial arrangement of the XML file to express the changing temporal arrangement of the narrative episode, the manual labor taken to structure the document fashioned an editorial experience of Proust’s modernist technique. I used location IDs to link fragments of text that appear in different sections of the document, constantly moving back-and-forth between different spatial and temporal permutations of the same episode. This is how Proust composed À La Recherche Du Temps Perdu, written in separate fragments that he connected systematically through the process of composition. His modernist technique, known for creating multiple scenes that recall and echo each other (embodied in his concept of involuntary memory), was fashioned by refining the process that remains unfinished in Jean Santeuil, interlinking temporally fragmented episodes into a harmonious and resonant narrative. Purely visual representations of the Penmarch fragment fail to capture this editorial experience. Working through Proust’s modernist temporalities requires an interactive and hands-on experience (an editorial experience) rather than a purely textual and visual representation (a readerly experience). That is, communicating my argument about the genesis of Proust’s modernist technique using digital methods calls for a dynamic and operable interface. Frameworks for this approach exist in the field of videogame design, and indie game development platforms offer tools for developing such an interactive scholarly experience. In September, merritt kopas led a workshop on videogame design as part of the Building Public Humanities project. For the workshop, she demonstrated game design fundamentals using Twine and her work with Construct 2. How could such design tools and principles be implemented in a scholarly context? In the instance of Proust, I’m considering how Twine could be used to produce a dynamic and interactive experience of the text that asks users to work through its spatial and temporal arrangement. Such an approach requires combining representation and design, reading and doing (if those acts can be neatly parsed). The product would not be an electronic text that moves the printed text onscreen, but rather an operable game that communicates the critical functions of scholarly editing. With this goal in mind, I’d like to unpack the connections between postmodern theories of textual editing and procedural rhetoric—connections that reveal a shared set of concerns, investments, and approaches across both textual criticism and game design. Here, McGann proposes a more radical iteration of Greg’s early editorial operations, suggesting that, by viewing the work as a dynamic environment capable of multiple states, interpretations, or editorial “views,” the editor can create an operable, interactive system in which users can explore the multiple permutations of the original work. If Greg advocates “reception as guiding the editorial function,” then McGann proposes a model for deploying that function in electronic environments, where the dynamic, operable nature of electronic environments can communicate the dynamic operations of interpretive scholarly editing. Of course, leveraging the affordances of electronic environments to transform the practice of scholarly editing is not a new concept. The Ivanhoe Project, developed by Jerome Mcgann and Johanna Drucker, is one existing instance of a scholarly editing game. Elsewhere, Neil Fraistat and Steven Jones have explored textual operations in electronic environments through their concepts of “Immersive Textuality” or “architexturality.” John Bryant’s fluid text environment and D. F. McKenzie’s sociological approach also examine textual fluidity and multiplicity, while exploring the affordances of representing textual change in digital environments. Whereas these approaches focus on new spaces for scholarly editing online, I would rather look at the operation of textual interpretation itself, considering how the algorithmic and procedural operations of videogames offer not only new environments but also new interpretive mechanics that allow the operations of scholarly editing to function in new ways and engage with new audiences. Galloway’s distinction between looking and doing, or between reading and acting, is complicated by theories of scholarly editing, which reveals textual operations as acts of interpretation and engagement that prompt material change in texts. Still, through his characterization of videogame interactions as dynamic operations that effect material change (as opposed to static acts of reading and looking), Galloway reveals deep ties between the operations of videogames and editing. If scholarly editing reveals the methods, techniques, and processes of production that shape a given text (in order to produce a scholarly argument about the work), then it shares deep affinities with procedural rhetoric, which uses systematic ways of working through processes in order to craft interactive, operable arguments. As a design principle deployed to structure persuasive interactions with dynamic media, procedural rhetoric thus resonates (if only in part) with the methods and concerns of scholarly editing. The persuasive operations of videogame design and the interpretive operations of textual editing offer a rich overlap through which scholars can craft hands-on critical experiences that communicate textual arguments. How can we enrich and extend arguments about modernist technique through the algorithmic logic of game design? I look forward to sharing our findings in future posts. Bogost, Ian. Persuasive Games: The Expressive Power of Videogames. Cambridge, MA: MIT Press, 2007. Print. Galloway, Alexander R. Gaming: Essays on Algorithmic Culture. Minneapolis: U of Minnesota Press, 2007. Print. McGann, Jerome. Radiant Textuality: Literature after the world wide web. New York: Palgrave, 2004. Print. Post by Alex Christie, attached to the ModVers category, with the versioning tag. Image for this post care of Alex Christie.